One of the most used parts in our home is the bathroom. It is where we want to get truly clean. That is why cleaning the bathroom is one of the most essential household chores. The toughest thing in cleaning a bathroom is dealing with the stains on the shower doors. Have you ever asked yourself what are these spots, streaks, and stains? Do you know where did it came from or how did it form? We don’t pay much attention to these stains; that is why when it accumulates, it is such a pain during cleaning time. Water becomes hard when the presence of dissolved minerals is in high quantity. These minerals are calcium and magnesium. It may not affect our health, but it is a nuisance in our home because of the mineral buildup not only in our bathrooms but also in other parts of our home. Because water is a good solvent, it picks up impurities easily. When combined with carbon dioxide, it becomes an even better solvent. Compared to glass surfaces, water dissolves a small amount of minerals in soil and rock. The higher the calcium and magnesium content, the harder the water. These water spots or limescale found in your shower doors occur when droplets of hard water dry on a surface. As the water evaporates, it leaves the minerals behind. There are various solutions to remove these stains. The do-it-yourselfers use alkaline or bleach to get rid of this soap-scum-plus-limescale dilemma in the bathroom. To save yourself from the hassle of looking for the ingredients in different stores, mixing the ingredients, and applying the end product, or to save your money from the ready-made household cleaners that cannot guarantee you a 90-100 percent outcome, use the Glasstastic Surface Restoration and Protection products. The first solution is the Glasstastic Hard Water Stain Remover. This remover works faster compared to other cleaning products or remedies you’ve seen in the Internet. It is the perfect solution for your shower doors. You can also apply it to your windows or any glass surfaces in your home. This remover has a pleasant scent that is why it is easy to apply. As simple as a scrub, a rub, and rinse of this product will do the trick. The second solution is the Glasstastic Glass Guard. 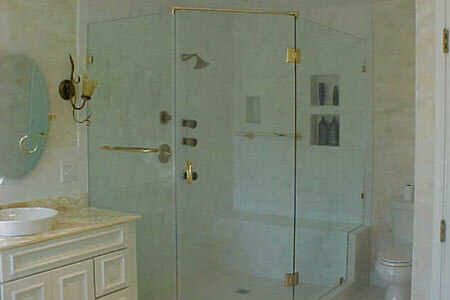 To prevent your shower doors from the stains to occur, it is best to use a protector. This product serves as a coating for your shower doors. A quick and simple application of this can ensure you a long-lasting result. The third and last solution is the Glasstatic Renew Surface Cleaner. This serves as the maintenance. It protects the original treatment from damaging. With this, you don’t need to apply chemical cleaners on a daily basis. Also it will take you months to reapply the remover and the protector. Just spray the product on your shower doors and then wipe it with a cloth. Viola! Your shower doors are as new as your first year in your home. These products were designed to help you enjoy and easier application and maintenance and save you from spending too much. These products are affordable, safe, and easy to use.